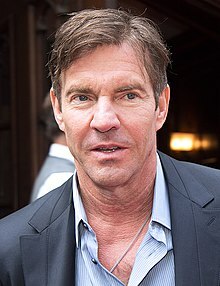 Dennis William Quaid was born in Houston, Texas, the son of Juanita B. "Nita" Quaid, a real estate agent, and William Rudy Quaid, an electrician. Quaid has English, Irish, Scots-Irish, and Cajun (French) ancestry. He attended Paul W. Horn Elementary School in Bellaire, and Pershing Middle School in Houston. He studied Mandarin and dance at Bellaire High School in Bellaire, Texas, and later in college, at the University of Houston, under drama coach Cecil Pickett, who had previously taught at Bellaire High and whose daughter is actress Cindy Pickett. He was raised in the Baptist faith. He is the younger brother of actor Randy Quaid. Quaid dropped out of the University of Houston before graduating and moved to Hollywood to pursue an acting career. He initially had trouble finding work but began to gain notice when he appeared in Breaking Away (1979) and earned good reviews for his role as astronaut Gordon Cooper in The Right Stuff (1983). Known for his grin, Quaid has appeared in both comedic and dramatic roles. Quaid had starring roles in the films Jaws 3-D (1983), Enemy Mine (1985), Innerspace (1987) and The Big Easy (1987). He also achieved acclaim for his portrayal of Jerry Lee Lewis in Great Balls of Fire! (1989). In 1989, he also appeared throughout the Bonnie Raitt music video for the song "Thing Called Love." Quaid's career lost steam in the early 1990s, after he fought anorexia nervosa brought on when he lost 40 pounds to play the tuberculosis-afflicted Doc Holliday in Wyatt Earp and recovered from a cocaine addiction. He continued to garner positive reviews in a variety of films, however. Quaid was also the guest star of a season 2 episode of Muppets Tonight (1997). He starred in the lead role in the 1996 adventure film Dragonheart, the remake of The Parent Trap (1998), playing the part of the twins' father, and as an aging pro football quarterback in Oliver Stone's Any Given Sunday (1999). In 1998, he made his debut as a film director with Everything That Rises a television movie western in which he also starred. Some of Quaid's more recent film credits include Frequency (2000), The Rookie (2002), Far from Heaven (2002), Cold Creek Manor (2003), The Flight of the Phoenix (2004), The Alamo (2004), In Good Company (2004), The Day After Tomorrow (2004), Yours, Mine and Ours (2005), Vantage Point (2008), G.I. Joe: The Rise of Cobra (2009), and Pandorum (2009). In 2009, Quaid guest starred in an episode of SpongeBob SquarePants, playing Mr. Krabs' grandfather, Captain Redbeard. He portrayed U.S. President Bill Clinton, alongside Michael Sheen as Tony Blair and Hope Davis as Hillary Clinton, in the 2010 film The Special Relationship. In 2012 and 2013, Quaid played Sheriff Ralph Lamb in the CBS TV drama series Vegas. In 2017, he starred in A Dog's Purpose as Ethan Montgomery, billed as "a celebration of the special connection between humans and their dogs". In 2018, Quaid starred in I Can Only Imagine, where he played Arthur Millard, the father of singer and songwriter Bart Millard, and Kin, where he plays Hal, the father of the film's two protagonists. In March 2018, it was confirmed by director Sean McNamara that Quaid would portray President Ronald Reagan in an upcoming biopic, titled Reagan. The film is slated to have a summer 2019 release. Quaid has been married three times and has three children. Quaid and his first wife, actress P. J. Soles, were married on November 25, 1978. The couple divorced in 1983. On February 14, 1991, Quaid married actress Meg Ryan. Quaid and Ryan fell in love during the shooting of their second film together, D.O.A. Quaid and Ryan have a son, Jack Henry Quaid (born April 24, 1992). Quaid and Ryan announced their separation on June 28, 2000, saying they had been separated six weeks by then. Their divorce was finalized July 16, 2001. Quaid dated model Shanna Moakler in 2001. The relationship lasted for eight months. Quaid married Texas real-estate agent Kimberly Buffington, on July 4, 2004, at his ranch in Paradise Valley, Montana. They have fraternal twins, Thomas Boone and Zoe Grace, born via a surrogate on November 8, 2007, in Santa Monica, California. On November 18, 2007, hospital staff mistakenly gave Quaid's ten-day-old twins a dosage of heparin (a blood thinner) that was 1,000 times the common dosage for infants. The babies recovered, but Quaid filed a lawsuit against the drug manufacturer, Baxter Healthcare, claiming that packaging for the two doses of heparin are not different enough. In May 2008, the Quaids testified before the United States House Committee on Oversight and Government Reform, asking U.S. Congress not to preempt the right to sue drug manufacturers for negligence under state law. This incident led Quaid to become a patient-safety advocate, producing a series of documentaries on preventable medical errors that aired on the Discovery Channel as well as co-authoring a medical journal article addressing the positive influence of patient stories in motivating change in healthcare. The first documentary, Chasing Zero: Winning the War on Healthcare Harm, aired on the Discovery Channel in 2010, and the second documentary, Surfing the Healthcare Tsunami: Bring Your Best Board, aired on the Discovery Channel in 2012. Buffington filed for divorce from Quaid in March 2012. Buffington's attorney then withdrew the divorce papers on April 26, 2012. In the summer of 2012, Quaid and Buffington moved to California. In October 2012, Quaid and Buffington again decided to separate, and Buffington filed for legal separation, seeking joint legal and sole physical custody of the twins. After waiting to establish the required six months of residency in California, Quaid filed for divorce on November 30, 2012, asking for joint legal and physical custody of the children and offering to pay spousal support to Buffington. They then reconciled and the divorce was dismissed by September 2013. On June 28, 2016, the couple announced in a joint statement that they were divorcing, with Kimberly Quaid asking for full physical custody and joint legal custody. The divorce was finalized April 27, 2018. In addition to acting, Quaid is a musician and plays with his band, the Sharks. He wrote and performed the song "Closer to You" in the film The Big Easy (1987). Quaid also had a pilot's license and owned a Cessna Citation. He is also a one-handicap golfer, and in 2005, he was named as the top golfer among the "Hollywood set" by Golf Digest magazine. Quaid is a fan of the Houston Astros, and after the team's 2005 National League Championship-winning season, he narrated their commemorative DVD release. After the filming of The Express: The Ernie Davis Story, Quaid went to Cleveland Browns Stadium to dedicate Davis's jersey. There have been extensive stories about Quaid's past abuse of cocaine. In a candid 2002 interview with Larry King on his talk show, after King asked about his motives for using drugs, Quaid responded, "Well, you got to put it in context. Back in the late 1960s, early 1970s. That was back during the time where, you know, drugs were going to expand our minds and everybody was experimenting and everything. We were really getting high, we didn't know it. And cocaine at that time was considered harmless. You know. I remember magazine articles in People Magazine of doctors saying it is not addicting. It is just—alcohol is worse. So I think we all fell into that. But that's not the way it was." When asked if he believed he had ever been addicted to the drugs, he responded, "It was a gradual thing. But it got to the point where I couldn't have any fun unless I had it. Which is a bad place to be." Later in the interview he said, "But I saw myself being dead in about five years if I didn't stop." In a conversation with The New York Post, Quaid stated he was a registered independent and has voted for candidates from both major U.S. political parties. Quaid also expressed his independence from any political parties or ideologies and being open to other points of view. Quaid lent his name to the annual "Dennis Quaid Charity Weekend" (formerly the "Jiffy Lube/Dennis Quaid Charity Classic"), held in Austin from 2002 until 2007. The golf tournament attracted numerous celebrities with the proceeds split among local children's charities. Quaid worked with the International Hospital for Children in New Orleans. He made several trips to Central America in the nineties to help build medical clinics and transport sick children back to the U.S. for treatment they cannot get locally. For his role in Far from Heaven (2002) he won the New York Film Critics Circle Award for Best Supporting Actor, the Chicago Film Critics Association Award for Best Supporting Actor, the Online Film Critics Society Award for Best Supporting Actor and the Independent Spirit Award for Best Supporting Male. He received nominations for Best Supporting Actor from the Golden Globe Awards, the Phoenix Film Critics Society Awards and the Screen Actors Guild Awards. Quaid was also honored with a Distinguished Alumni Award from his alma mater, the University of Houston, in April 2012. 1977 Baretta Scott Martin Episode: "The Sky Is Falling"
2009 SpongeBob SquarePants Grandpa RedBeard Voice role; Episode: "Grandpappy the Pirate/Cephalopod Lodge"
Drunk History Lucky Luciano Episode: "Las Vegas"
2017 Workaholics Ted Murphy Episode: "Weed the People"
^ a b c d "Dennis Quaid Biography (1954–)". FilmReference.com. Archived from the original on May 29, 2016. Retrieved September 3, 2011. ^ a b c d e f g Stated in interview at Inside the Actors Studio. ^ "Actor Dennis Quaid on Jesus and the Bible--Christian Baptist Hindu Meg Ryan acting baptism Ganges prodigal son Sheahen - Beliefnet.com". Beliefnet. ^ Peter T. Chattaway (November 21, 2005). "Mr. Versatile 'Christianity Today'". Christianitytoday.com. Retrieved September 20, 2010. ^ Lyman, Rick (November 14, 2002). "Dennis Quaid's Second Reel: The Comeback". New York Times. New York. ISSN 0362-4331. Retrieved July 29, 2010. ^ Bonnie Raitt - Thing Called Love. YouTube. December 6, 2010. ^ Boodman, Sandra (March 13, 2007). "Eating Disorders: Not Just for Women". The Washington Post. Retrieved September 27, 2015. ^ a b Richmond, Ray (July 9, 1998). "Everything That Rises". variety.com. Retrieved May 13, 2018. ^ a b "Dennis Quaid is playing Ronald Reagan in a biopic, confirms director Sean McNamara". Metro. March 28, 2018. Retrieved June 5, 2018. ^ a b Schneider, Karen S. (July 17, 2000). "Sweethearts Sour". People. 54 (3). Archived from the original on April 23, 2008. Retrieved February 15, 2019. ^ Richter, Erin (February 16, 2001). "Her Funny Valentine: Dennis Quaid and Meg Ryan tied the knot 10 years ago". Entertainment Weekly. Archived from the original on November 19, 2015. Retrieved March 8, 2012. ^ "Shanna Moakler". Extra. October 26, 2001. Retrieved April 2, 2007. ^ "Shanna Moakler is Devastated over Split". Moakler MySpace blog via CelebSpin.com. August 11, 2006. Archived from the original on July 24, 2008. Retrieved May 8, 2007. ^ Keeps, David A. (April 2006). "Dennis Quaid". Best Life. III (3): 22–25. Retrieved August 7, 2011. ^ "Dennis & Kimberly Quaid Welcome a Boy & Girl". People. November 8, 2007. Archived from the original on March 4, 2016. Retrieved February 15, 2019. ^ Haldeman, Peter (November 2008). "Dennis Quaid". Architectural Digest. Retrieved September 3, 2011. ^ "Dennis Quaid's Newborn Twins Fighting for Life". Fox News. November 21, 2007. Retrieved September 20, 2010. ^ Ornstein, Charles; Gorman, Anna (November 21, 2007). "Possible medical mix-up for twins". Los Angeles Times. Retrieved July 19, 2011. ^ "Dennis Quaid and wife sue drug maker". USA Today. December 4, 2007. ^ Quaid, Dennis; Quaid, Kimberly (May 14, 2008). "Testimony of Dennis Quaid and Kimberly Quaid Before the Committee on Oversight and Government Reform of the United States House of Representatives" (PDF). pp. 1–7. Archived from the original (PDF) on August 14, 2009. Retrieved June 10, 2010. ^ a b Landro, Laura. "Patient Safety: The Movie". The Wall Street Journal. Dow Jones and Company. Retrieved February 1, 2016. ^ a b Grant, Meg (September 2010). "Dennis Quaid's Quest". AARP. AARP. Retrieved January 27, 2016. ^ Quaid, Dennis; Thao, Julie (March 2010). "Story Power The Secret Weapon" (PDF). The Journal of Patient Safety. 6 (1): 5–14. Retrieved January 27, 2016. ^ "Discovery Channel to air patient-safety documentary tomorrow". AHA News. American Hospital Association. Retrieved January 29, 2016. ^ O'Reilly, Kevin. "Celebrities make pitch for patient safety panel". American Medical News. American Medical Association. Retrieved January 28, 2016. ^ Hill, Terry. "Actor seeks media aid in sounding alert for health care safety". The National Press Club. The National Press Club. Retrieved January 28, 2016. ^ "Dennis Quaid Remarks on Medical Errors". The National Press Club. The National Press Club. Retrieved January 28, 2016. ^ "Dennis Quaid's wife files for divorce, report says". Fox News. March 9, 2012. ^ "Dennis Quaid's Wife Withdraws Divorce Papers". People. May 4, 2012. ^ a b "Dennis Quaid Files to Divorce Wife Kimberly Buffington-Quaid". Us Weekly. Retrieved December 13, 2012. ^ "Dennis Quaid's Wife Files for Separation Five Months After Pulling Plug on Divorce". E News. Retrieved October 19, 2012. ^ "Dennis Quaid & Wife -- Divorce Dismissed ... Now Let's Bike Together!". TMZ.com. September 7, 2013. Archived from the original on September 9, 2013. Retrieved June 29, 2016. ^ "Dennis Quaid's Wife Files for Divorce ... Again". TMZ.com. June 28, 2016. Archived from the original on June 29, 2016. Retrieved June 30, 2016. ^ "CNN.com – Transcripts". Transcripts.cnn.com. March 12, 2002. Retrieved September 20, 2010. ^ "Dennis Quaid to sing in new documentary on political censorship". The New York Post. December 24, 2018. Retrieved December 26, 2018. ^ "Dennis Quaid : Awards". Internet Movie Database. ^ "Betty Gilpin Joins Dennis Quaid, Josh Gad in 'A Dog's Purpose' Follow-Up (Exclusive)". Hollywoodreporter.com. August 26, 2018. ^ Pete Vonder Haar (January 7, 2016). "Join the Houston Film Critics Society This Saturday for Its 2015 Awards Show". houstonpress.com. Retrieved September 19, 2018. Silver, Murray (2005). When Elvis Meets the Dalai Lama. Savannah, Georgia: Bonaventure Books. Author describes Quaid's participation in the film Great Balls of Fire. Wikimedia Commons has media related to Dennis Quaid.